The 2015 Topps Archives Baseball autograph checklist got a big boost. And like last year's Major League cards, it's got little to do with MLB stars. Will Ferrell was added to the set following his ten-teams-in-one-day run during Spring Training. In March, Ferrell had a marathon of a day, suiting up for ten teams in one day. He also made his way around the diamond, playing every position. While part of it was to promote a show, the actor's gear was also auctioned off to raise money to fight cancer. The 2015 Topps Archives Will Ferrell autographs are his first certified autograph cards. He has actually appeared on very few trading cards overall. His most notable are promo sets for Anchorman and Semi-Pro. 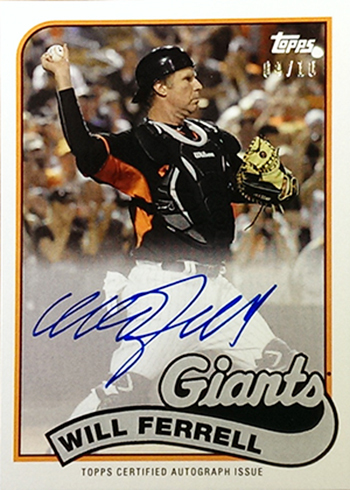 Ferrell is also well known for not being much of an autograph signer in general. Given that there are only 100 total 2015 Topps Archives Will Ferrell Autographs, the cards are extremely tough to pull. They land 1:4,507 hobby packs, 1:8,360 retail packs and 1:24,968 blaster packs. Besides the autographed versions, there are also unsigned Will Ferrell cards in the retro-themed product. These are much easier to find, landing one per hobby box. I like the 2015 archives cards. Card throw backs are good, maybe they will do throw backs from each decade starting next year 2016. But putting in a sub set of Will Ferrell cards I don’t think is needed. Jacking up the price to $5 per pack or $100 per box at time of release June 2015 is a bit much for a movie probably won’t be that good. The archives cards from 2014 are hard enough to find for a movie that wasn’t that good. Hopefully Topps won’t put in non players anymore.